American CEO/Dictator Donald Trump is on his first world tour and lo and behold his first stop isn’t traditional allied countries like France, Germany or Great Britain, it’s authoritarian paradise Saudi Arabia. 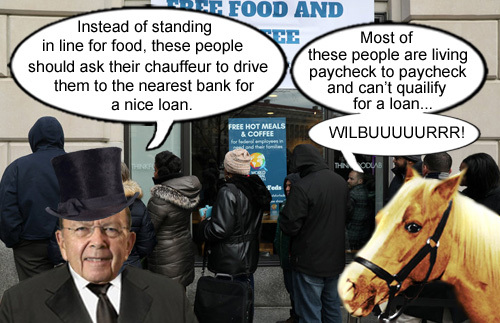 Secretary of Commerce and plutocrat, Wilbur Ross, went with him and when he wasn’t sleeping, he noted that there was not one instance of protest against Trump. Fortunately, the journalist conducting the interview corrected Ross, stating protests aren’t allowed in Saudi Arabia, to which Ross fumbled around like the old, fussbudget billionaire he is, embarrassing himself and his country. We think that even good ol’ Mr. Ed would probably be able to explain it best to Wilbuuuuurrr about the stupidity of his inane remarks . 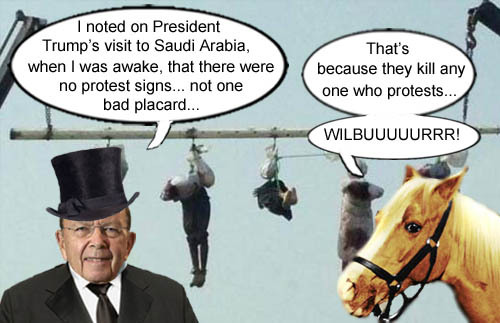 Talking horse and connoisseur of the name Wilbuuuuurrr, Mr. Ed, explains to Secretary of Commerce Wilbuuuuurrrr Ross how utterly asinine his insipid comments were about nobody protesting in Saudi Arabia.